Full disclosure..........I didn't make the set in that picture. I grabbed it from someone many years ago. White - any thoughts on best bait? I've discovered a trick while filming them. Well my go-to is beaver but I have had good luck with really, really rotten meat scraps. Stuff so bad that I've almost resorted to smearing toothpaste on my upper lip while handling it. I know they will investigate every beaver house in the area and they seem to know where every porky den is. Each one that comes through will check out each porky hole in the country. If I encounter one that is of the super wary variety, that is really hesitant to commit to working a set, a piece of beaver with patches of hide attached seems to make a difference. I tried porky on the "canopener" when he was giving me fits years ago and it was a no go. Loved them for coyote bait in Montana. You have our interest peaked Bushman. Beaver tails. I nail them to trees as well as have full beaver carcass hanging and my cameras shows the wolverine always goes for the tail first. I figure the tails have to have the most fat in them and calories. Actually that's the part that I use the most. Not just the tail but the rear 1/4 of the beaver with the tail attached. I also wonder if there is more scent on the tail due to proximity of the castor ?? Castor hmmm, I bet it does help pull them in. Stands to reason, roasted beaver tail is pretty good stuff! They work well on marten and they are tough. The birds can work them and not do much damage. I have nailed them right to a tree trunk or leaning pole. Lasts a long time. Same goes with the feet. They always went into the discard bag. I have skinned a number of them with the tail on but it is an old habit of cutting them off that is hard to break. Good reason to now. Proof is in the photo!!. Pete - a buddy set a trail cam at a body grip. 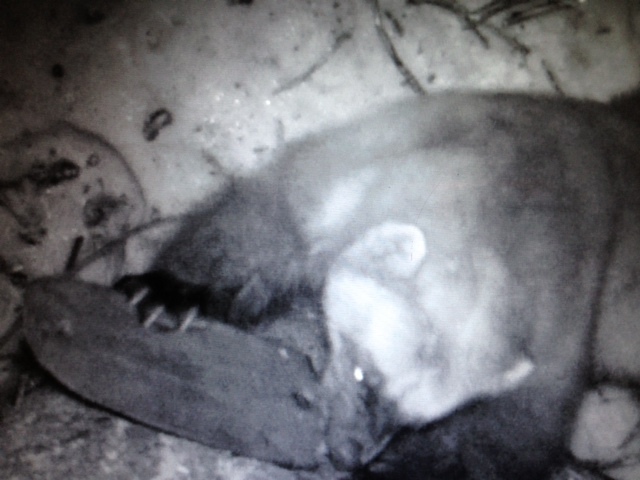 A wolverine got caught and even though death was quick its immediate reaction was to roll over and over until expiry. Makes a good case for swivels. I also think an elevated horizontal log snare set for wolverines works pretty good. The one where log is 8 feet high, two snares on each end of a ten foot log. A couple logs leaning on each end for gulo access. Beaver hanging down from middle of log, too high for access from ground. Snares are long enough that when wolverine jumps off log it's left hanging suspended where it can't get feet on ground or scramble back up on log. Someone posted a pic of a wolverine double at one of these sets a long while back. I agree that a combination of multiple swivels and a setup that keeps the animal with its feet off the ground is the best bet for a snare set. That said, I have never spent much time trying to snare them when other more dependable methods were available. I only would go to snares when one had wised-up to other steel. Frankly I was always afraid that I would not get the loop right behind the ears and the beast would chew through the cable. In my experience, if that loop is just an inch further back, it puts it up onto those famous neck muscles and prolongs the process, giving the gulo a much better chance to prove he is tough! 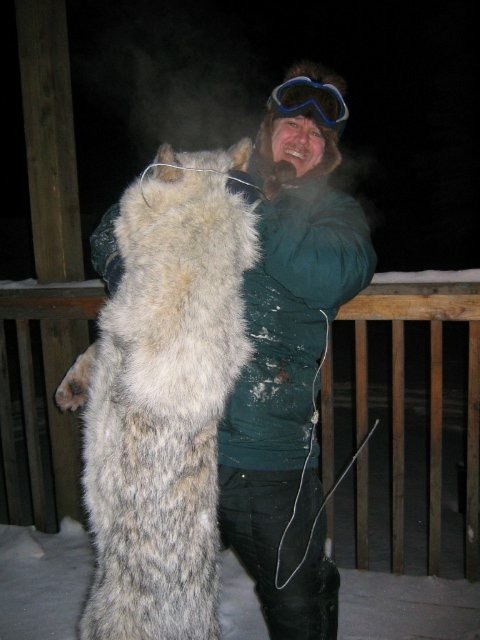 A lot of trappers here lose lynx snares to wolverine More than one gulo is caught still wearing those light snares. I don't think there is much effort made to snare them here, a body grip is usually lethal and with no drama, not like that Yukon man style. Come to think of it, I've never tried to beat one to death with a spruce pole either.....! I have snared a lot of them.....some years as many as 7 or 8. The majority have been caught in snares on a horizontal pole. Never used swivels of any kind and Ive never lost one caught in that set. I have seen two caught right behind the head with a 330 that were still alive....I chased one for 2 miles........Set properly I feel snares are the only way to go......more than once I have caught 2 at the same set.